You all know I'm a vest girl. I love that extra layer of warmth without the bulk on my arms. I have four puffer vests, a suede vest, and a fur vest and this season I added two long sweater vests to my collection. Both are from CJBanks (no longer available, similar HERE); I bought one in black and one in burgundy. I styled my vest with a sheer dark floral shirt (old, JCPenney), black straight leg jeans (St. John's Bay) with a black belt, a black fur infinity scarf, black booties, and my Liz Claiborne Elizabeth Tote. The long length of the sweater vest is very slimming. My scarf I purchased at the Mall of America years ago. I also bought a leopard print and camel color at the same time. They are so soft and luxurious. Because I wore a scarf, and my top has such a busy print plus a lace up neckline, I did not wear a necklace, but chose these pretty black drop earrings instead. I also wore a rust love-knot ring to match the rust color in the top. A friend of mine made this ring for me years ago. I've been noticing in Blog Land that women are wearing higher waist pants and tucking in their shirts again. I for one couldn't be happier about it! I've always carried my extra weight in my tummy, so I love the idea of wearing higher waist pants and tucking it all in! I also like that belts are re-emerging on the scene; I think they add so much interest to an outfit. Although how everyone is affording those Gucci belts I have no idea! Yikes, they are expensive! Get use to seeing my husband's woodpile being my photography background for the next few months. It's too difficult trying to walk out in the yard with all the snow. The wood pile is right out my back door, so it's nice and convenient. I actually think it makes a nice backdrop too! So what about you? Are you happy with the higher waistlines or do you prefer low rise? Do you like to tuck your shirt in and wear a belt? I'd love to hear from you! That's so funny! Everyone has a wood pile in my neck of the woods. Thanks for visiting! Love this outfit, Amy. Love every element. No belts for me though, I don't have a trim waistline to showcase, but you do, the belting suits you. And I won't tire of looking at that woodpile, it must have taken your hubby months to chop! Awww, thank you! I actually don't have a waist line either, that's why I like high waited pants because they rise higher going over all my tummy flab and tucking everything in giving me the illusion of a waistline. I think you could wear high waisted pants too! And yes, my hubby spends a lot of time chopping wood! It's his winter exercise. Oh, thanks Leslie! I agree the longer length makes anyone look slimmer. I get frustrated wearing them under winter coats though...most of my jackets are not this long. I was bummed that CJBanks was sold out of these dusters already...I just bought them! But I think the Macy's option is very close! The wood pile makes a fabulous background for your pictures. Great outfit, love the vest! I don't own any high rise pants, I usually go for mid rise although I've had a few low rise pants too, but I'm pretty sure I've donated all of them. I'm glad you like the color Elli, some people think it's funny that I'm posing in front of a woodpile, but a lot like it too. It's a nice, warm, interesting color for background photography too. I think these jeans are actually considered a mid-rise too. I keep looking for a true hi-rise in the stores to try on, but there's not a lot available yet. My area is always the last to catch on to the trends. We just got OTK boots here this year! haha! That duster is such a great item! I love that you layered a printed blouse underneath! Thanks Laura! I think the printed blouse adds a lot of interest to the outfit; far more than a solid one would. Love this look on you Amy! I feel like dusters just have a slimming effect and make us all look a little taller. Hmmm...why don't I have one?!! Thanks Shelly, I totally agree about the slimming effect! I saw these pictures and thought "Who is this woman?"! haha! I didn't recognize myself. I love the floral blouse. It's perfect with the knit vest for winter. I think the woodpile is so cute and really it's perfect for winter because it's all about keeping warm right? Thanks Ruth! I think the floral goes great with the all the solid blacks going on with this outfit. You look great in the vest. I like the whole outfit! I like higher waist pants myself. I was never comfortable in the "low rise" pants. As for tucking in...I wish I had the waist I used to have. Tucking in looked better back then! Oh I know Debbie. I suffered in low rise pants for years because they were "in", I always found them so uncomfortable. The things we do for fashion. I think you could tuck your shirts in, especially if your pants have a higher waistline. You're smaller than me! I love this floral top, so romantic! The long vest is so pretty! I love layering in the Winter and this is such a versatile piece! This is the perfect combination! I love that floral top and it looks so sophisticated with the black vest and bag. Thanks so much for linking and I hope you have a great weekend! Loving the all black with a pop of floral here! This is sure a fun and cozy way to sport those sleeveless knit duster. Lovely floral top! The duster looks fab with the printed blouse and faux fur scarf. 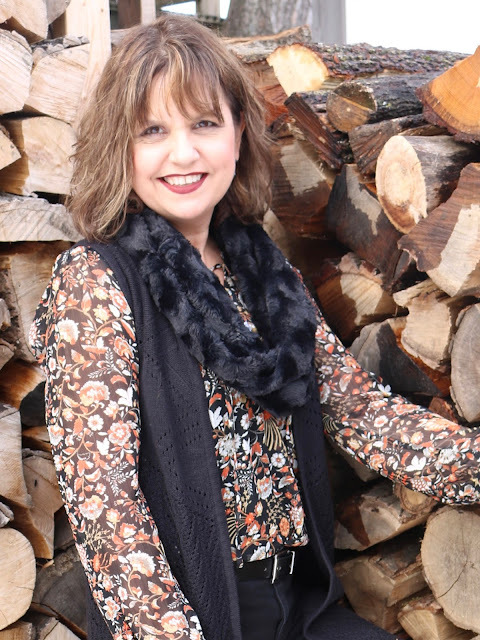 The woodpile makes a lovely backdrop for photos! Thanks for linking up!